On 19 April 1770, the Archduchess Marie Antoinette married Louis, the Dauphin of France, by proxy. At 6:00 pm, the 14 year old bride, wearing a glistening and luxurious gown of cloth of silver, with a train carried by Countess Trautmannsdorf, entered the Church of the Augustine Friars, where her parents had got married too 34 years ago. Her mother, the Empress Maria Theresa, led her up the aisle, before sitting down, next to her son Joseph, on a dais to the right of the altar. The ceremony was officiated by the Papal Nuncio, Monsignor Visconti. 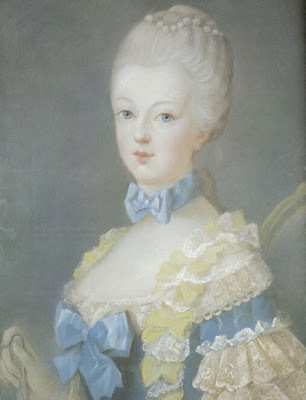 Marie Antoinette’s proxy bridegroom was her brother the Archduke Ferdinand. His role was easy. Antonia Fraser, in her biography of Marie Antoinette, says that Ferdinand “simply had to take the Latin vow, ‘I am willing and thus make my promise,’ kneel beside his sister and enjoy the nuptial supper at her side.” Then, the vows were taken and the rings blessed. Once the ceremony was over, it was time to celebrate. Salvoes were fired outside, while trumpets and kettledrums started playing. At 9.00 pm, the party then went to dinner, which lasted several hours. Poor Count Khevenhüllern mustn’t have enjoyed that very much though. He had to stand, behind the chair of the Emperor, throughout the dinner! Finally, everyone went to bed, but celebrations resumed the next day. Two days after the proxy wedding, Marie Antoinette left Austria for France. She would never see her native country again.